Large oil painting done on primed paper maflouaged onto canvas. Animated expressive brushstrokes for winter wind, frost and dead bracken, sparkling in winter sunshine. 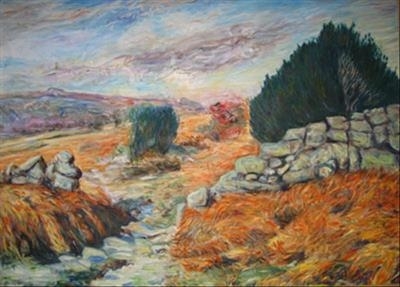 The gate is on a "permissive" path through Emsworthy fields behind Saddle Tor, near Hay Tor and the Becka Brook in Dartmoor.